Daycare, originally uploaded by [Zakkaliciousness]. 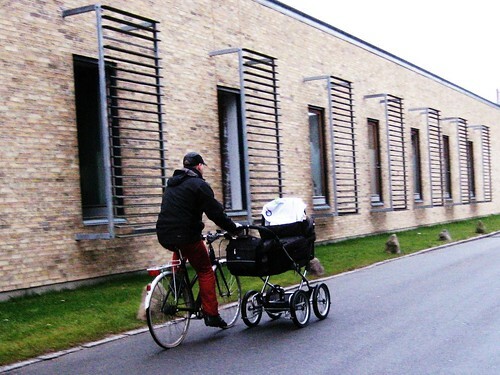 Now here's a cool variation on the 'dropping kids off at daycare' theme in Copenhagen. I doubt that he would venture out of the busy bike lanes like this, but it serves the purpose on quiet roads in this neighbourhood. In Denmark we have 12 months of maternity leave and three months of paternity leave, on average. Your children get a spot in a daycare [vuggestue] from the age of about 8 months, although most people I know start them at about 12 months. At the age of three they move on to a kindergarten [børnehave] until they start in school. This model is popular in the Scandinavian countries. Emphasis is placed on developing social skills and placing kids together from a young age serves to help teach them to be a part of a societal structure. It is extremely rare, in my experience, for parents to keep a child at home. Not only because they have jobs, but because the child will be 'out of the loop' socially if they start later.